A must have accessory for all solar observing and imaging. The solar finder allows you to locate the Sun with minimum effort and maximum safety. Simply centre the sun in the target! Supplied with a self centering base. 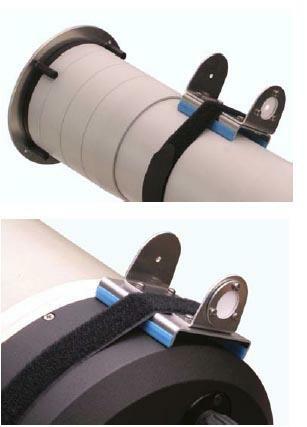 Attaches to you telescope tube using velcro. This version is supplied with a small base suitable for use with tubes up to 6" diameter. Really Useful Piece of Kit! straightforward and simple to use, with the benefit it can be used on a range of telescopes as is easily interchangeable. The sun is just projected as a bright dot on the frosted screen making lining you scope up a doddle! Recommended piece of equipment as finding the sun safely is not as easy as you may think!